Description The ancient Egyptians believed that the dung beetle, the Scarabaeus sacer, was one of the manifestations of the sun god. Representations of these beetles were used as amulets, and for ritual or administrative purposes. 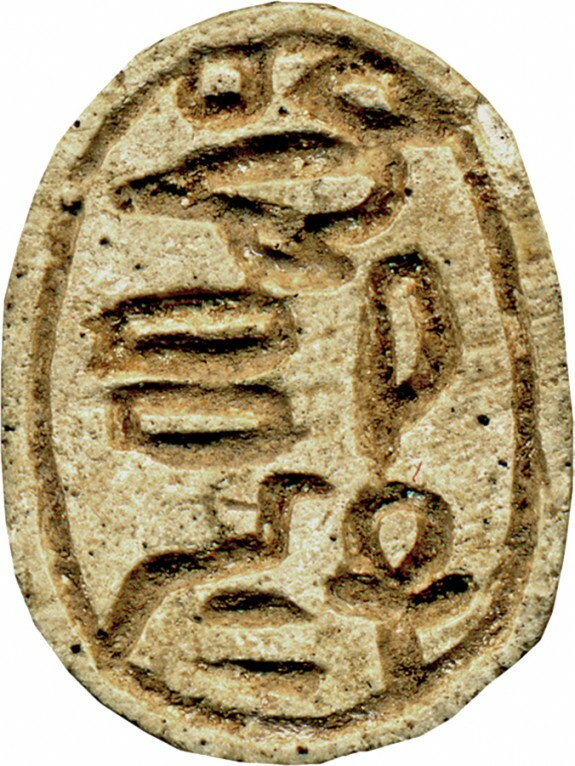 This scarab is a typical example of the Second Intermediate Period. The highest point of the back is the pronotum (dorsal plate of the protorax). Two short side-notches at shoulder height define the partition between pronotum and elytron (wing cases). The prontum is somewhat asymmetrical, and the notches, which differ in shape and depth, are not aligned. The head sections consists of a trapezoidal head, rectangular eyes, trapezoidal side plates with curved outer edges, and a clypeus (front plate) with central base notch. The sides of the scarab show no extremities, but two deeply incised circular lines, which define the partition between the body and the oval shaped base. The bottom inscription contains the name and title of the King Sheshi, as well as a formula wishing him life. The hieroglyphs are deeply carved and somewhat clumsy. The layout is somewhat unbalanced, and the top and bottom signs collide with the borderline. The scarab is longitudinally pierced, was originally mounted or threaded, and used as an amulet. It should secure the existence and divine monarchy for this king, and provide its private owner with his royal patronage. There are many scarabs with the name of king Sheshi (e.g. Baltimore, Walters Art Museum, 42.17 and 42.26), which were found in Egypt, Nubia, and Palestine. Nevertheless, there are no other monuments or historical records with his name. It is possible that the throne name of Sheshi was Maat-ib-Re, and scarabs with this name were similar popular and widespread. The identification of Sheshi with a Hyksos rulers or one of the Hyksos vassals is likely, but not positive. Furthermore, some scholars considered interpreting the name as a writing variant of the name of the well-known Hyksos ruler Apepi. Provenance Prof. Newberry (? ); Henry Walters, Baltimore, 1911, by purchase (? ); Walters Art Museum, 1931, by bequest. Inscriptions [Translation] Birth name of King Sheshi with "solar filiations": Son of Re: Sheshi, may he live forever.